There’s a hard deck on how bad any film that contains an exchange like this can be, and A Night In Old Mexico—a shaky hybrid of No Country For Old Men and Leaving Las Vegas—hovers just a few notches above it. 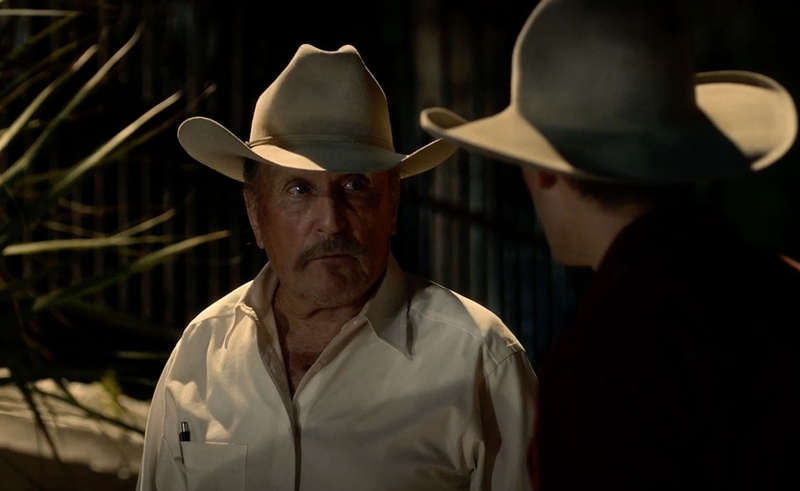 Director Emilio Aragón doesn’t want to choose a consistent tone any more than a bucking bronco wants a rider on its back, but he’s prodded along by another fine, scabrous performance from octogenarian Robert Duvall as Red. Red is the sort of guy who chucks his empty beer bottles out the car window as he’s driving, and keeps a revolver in the trunk that looks like it could fell low-flying aircraft. Most movie-lovers can readily recall what Duvall looked like in The Godfather in 1972. Still, it’s easy to imagine Matthew McConaughey turning into this guy over the next 40 years. Anyway, this sweaty yarn, which might charitably be described as “fable-like” in its narrative and emotional improbabilities, opens with a quotation from Dylan Thomas—the one everyone knows, yes. And rage Bovie does, against the dying of that old light. Also against those bastards from the surveyor’s office who’ve come to take his land. And against various species and genuses of bad, bad men from both sides of the border. And against the estranged, college-age grandson (War Horse’s amiable Jeremy Irvine, whose square jaw and English extraction should net him a superhero franchise within 24 months) he never knew he had, who has the temerity to show up and interrupt Red while he’s trying to commit suicide. The 12-car emotional pileup of rage, sadness, and hilarity Duvall summons with just a few parting words to God and his momma as he presses his gun to his temple offers a quick, powerful reminder, mere minutes into the film, that he remains one of our finest actors. Freshly evicted from his ranch, Red understands he’ll soon be home on the range—the big one up in the sky, that is—whether he pulls the trigger himself or not. Nothing frightens this seemingly fearless old-timer more than the thought of living out his last days in an old-folks’ trailer park. So he points his Cadillac south for one last hurrah in an unnamed Mexican border town, chasing the memory of the long-gone wife he met there maybe half a century before. The two young men Bovie collects along the way for gas money turn out to be trouble. Q: Who picks up hitchikers? A: People who’ve never seen a movie in their lives, that’s who. For a while, Bill Wittliff’s screenplay tracks two parallel narratives: a darkly funny farce where bad guys keep bumping into worse guys, and a relationship story following Red and his grandkid, Gally, who plays along reluctantly as Red drags him to a brothel, then a bar. Once these plots intersect, Red seems to try awfully hard to get himself killed—though his death wish, so brilliantly established early in the film, is tempered by a chaste romance blooming, with something less than complete believability, between him and Patty Wafers, a Mexican nightclub singer/stripper. Angie Cepeda, the Colombian actor who plays Patty, is potentially more interesting than the stripper-with-a-heart-of-gold character she’s given to play here. She was born the year Duvall turned 43, which makes the picture’s rose-colored climax tougher to swallow than a bag of dried prunes. Patty seems to fall for Red mainly because in the entire 12 or so hours they’ve known each other, he’s never, not even once, yelled at her to take her top off. “I’m Mexican,” she tells him. “We’re not afraid of having old people around.” Love conquers all, as they say. And probably won’t have to conquer it for long! Aragón, working on a $2 million budget, achieves an immersive sense of atmosphere. The film was shot mainly in the Texan cities of Brownsville and Rio Hondo, and their performances as Mexico are believable enough. Duvall’s turn as that crusty sumbitch Red is the reason to see the movie, though. A Night In Old Mexico would be stronger if it acknowledged a bit more how tall a tale it’s telling. But it’s good to see Duvall demonstrate so forcibly that he has no intention of going gently into that good night.